Research has shown that people experience emotional, behavioral and psychological benefits by being near water, according to Wallace J. Nichols, a marine biologist and author of “Blue Mind,” a best-selling book on the scientific connection between water and happiness. Nichols is now exploring how being on a boat benefits overall health. “The effect of boating on our lives and its fundamental connection to our planet’s waters are well documented from an economic, ecological and educational perspective,” Nichols told DiscoverBoating.com. “But the relationship of a boat to our health has been largely overlooked. Taking a page from recent politics, Nichols has come up with a dichotomy called “Red Mind, Blue Mind” to describe states of being. Red Mind is a state of mind described as an “edgy high, characterized by stress, anxiety and fear.” Stressors such as money and work have long impacted people, and Nichols said there are new stressors — for example, urbanization and the constant tether to technology — that offer little respite from today’s world. An antidote to Red Mind is Blue Mind, Nichols said, which is a mildly meditative state characterized by calm, peacefulness, unity and a sense of general happiness associated with the water. Nichols said boating triggers a restful state, providing a way to escape daily routines and allowing our minds to reset. 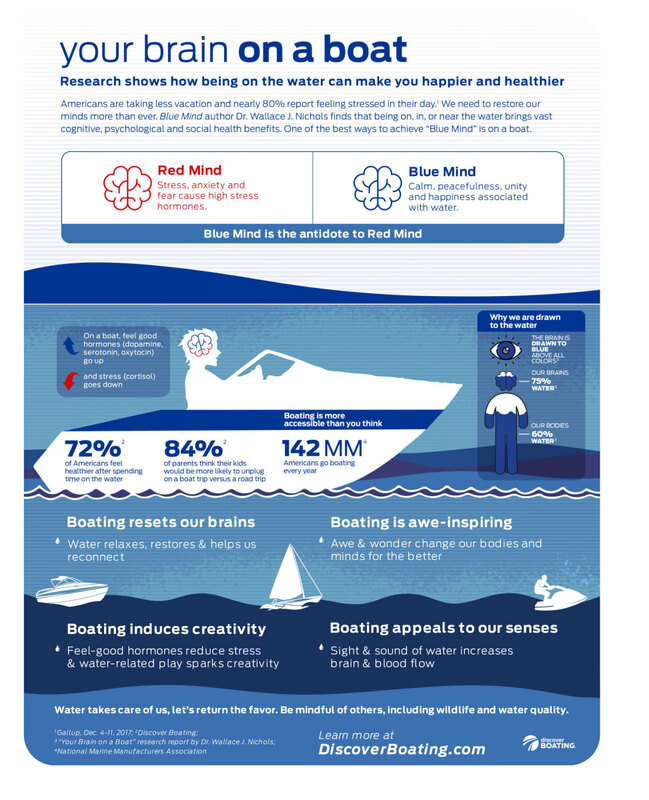 At the same time, being on the water on a boat promotes physiological and psychological changes that promote health and wellness, awe and wonder, creativity and play, and happiness and relaxation. Doing absolutely nothing is a lost art in our society, but it is more important than ever, as time spent in nature, Nichols said, is a valuable way to offset the stresses of living and working in modern contexts. Boating also promotes play and induces creativity by triggering endorphins. The mere sight of water also can induce a flood of neurochemicals that promote wellness, he added. A lifelong relationship to the water through boating brings cognitive, emotional, psychological, social and spiritual benefits. “Being on a boat is one of the best ways to access the wellness benefits of the water,” said Nichols.